There is no better place to see and be seen than the Kentucky Derby. This annual horse race in Louisville, KY is the social event of the spring. For first-timers, preparing for the big day may seem overwhelming. 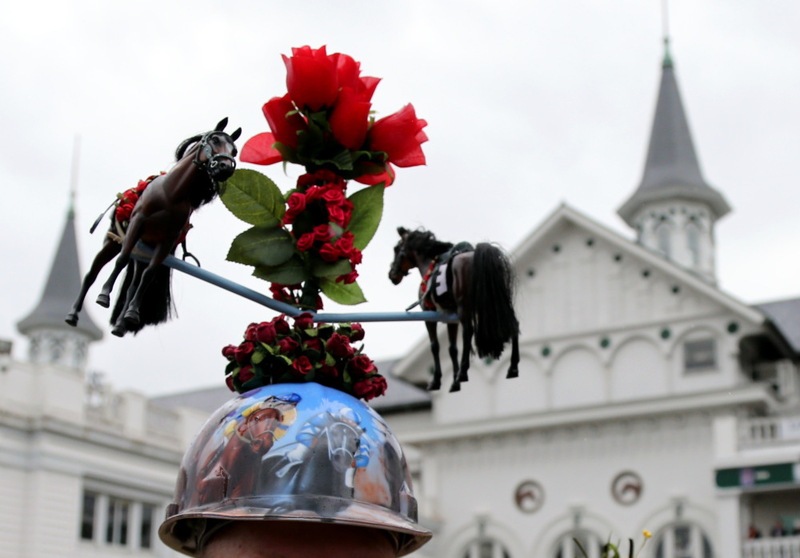 After all, Kentucky Derby fashion is in a league of its own. However, with a little planning and fashion flair, you can enjoy “the greatest two minutes in sports” in true Southern style — no matter where you’re from. Here are some tips on what to wear to the Kentucky Derby. Kentucky Derby attire has always been on the fancy side. Since its inaugural running in 1875, the Kentucky Derby has always courted the fashion-conscious. Founder Col. Meriwether Lewis Clark Jr. was enamored with the grand horse races he attended while traveling through England and France in 1872, and he wanted to create a similarly prestigious event in the United States. However, he was concerned that more conservative Americans might find the drinking and gambling associated with the event unsavory. To ward off any hints of seediness, he invited Louisville’s high-society ladies and gentlemen to attend the race in “full morning dress,” which was the poshest daytime dress code possible. 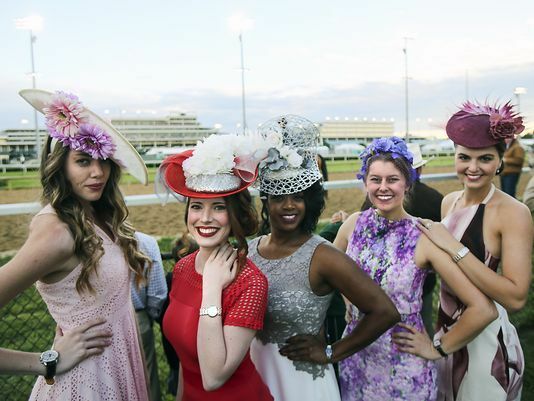 Since then, women and men have been flocking to Churchill Downs each May to strut their finest Kentucky Derby attire. Their outfits can be simple or bold, designer or handmade, but they’re always fabulous, and, for women, they almost always center on a jaw-dropping hat. 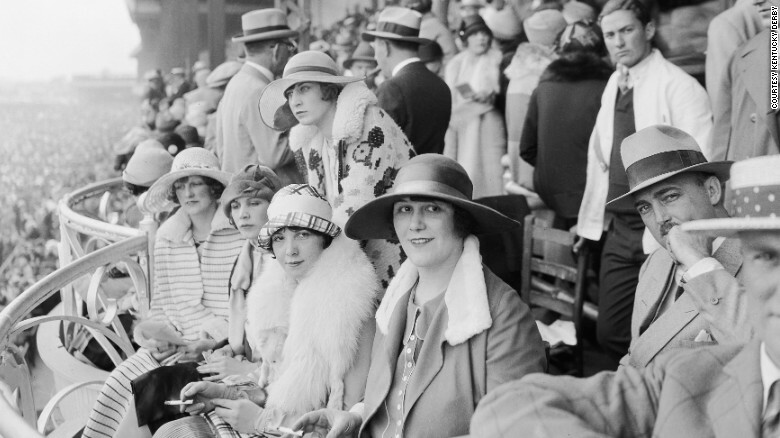 When the Kentucky Derby first began, hats were standard attire for well-dressed women. However, as fashion rules loosened during the 20th century, hats slowly fell out of favor, and this created a fashion opportunity for visitors to Churchill Downs. Because people no longer wore hats in their everyday lives, the event provided the rare chance to step out in something bold and attention-grabbing. Make no mistake, stunning headwear is so prevalent at the Kentucky Derby that you’ll likely feel underdressed if you choose not to wear one. It’s also supposed to bring good luck to your horse if you take part in the tradition. Besides, in this day and age, it is rare that opportunities to wear elaborate, decorative headwear present themselves. Derby is truly a moment to take advantage of. Since your hat is the star of the show, plan your entire outfit around it. If you want to achieve a “Southern Belle” look, choose something with a wide brim and decorative accents, such as flowers, ribbons or feathers. If royal chic is more your style, go with a Kate Middleton-inspired fascinator hat. Remember, there are really no wrong choices when it comes to your hat — other than choosing not to wear one. Once you’ve chosen the perfect hat, you’re ready to build the rest of your outfit. If your hat is a show-stopper, choose a simple dress that doesn’t compete with it. If your hat is conservative and elegant, like a fascinator, choose something sleek and classy to pair it with. However, don’t overthink it too much. Trust your instincts and have fun. Compliment your hat with either simple, classic cuts or bolder, edgier ones. Photo by Dave Bennet. As for shoes, keep in mind that you’ll encounter cobblestone, grass and steps at Churchill Downs, so flexible footwear is key. A chunky heel is a safe bet, but those who are determined to wear stilettos may want to pack some emergency flats for later in the day. Finally, you’ll need a bag to finish off your look. 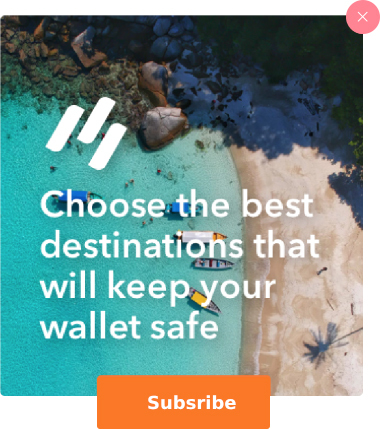 Actually, you’ll probably need two bags. The first bag should be a chic clutch that accents your outfit. The second bag should be a larger, though still stylish, tote to carry your flats and other must-have items. 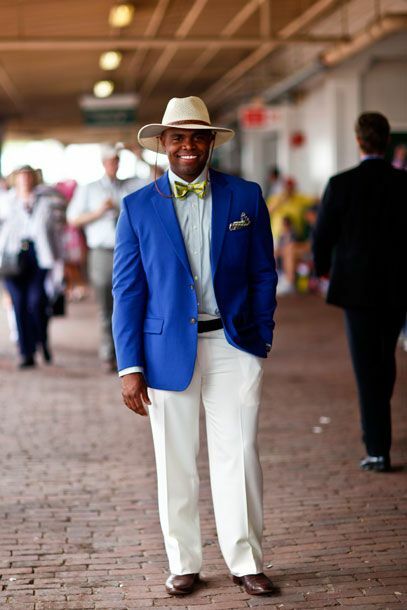 Men also love to dress their best for the Kentucky Derby. While it’s all about the hat for the ladies, it’s all about the color palette for the gents. 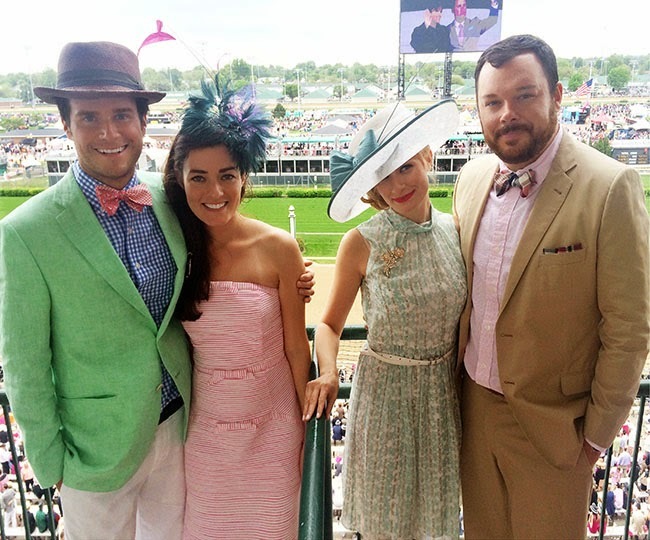 Pastels, tropical colors, plaids and stripes are all popular choices for an appearance at Churchill Downs. 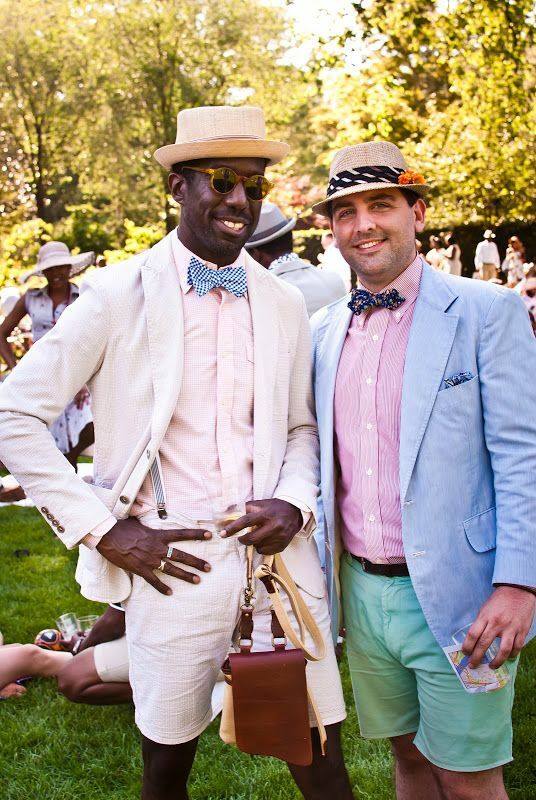 Kentucky Derby is the place for men in pastel. Accessorize with bow ties, hats, suspenders, and leather bags. Photo by Kate Warren. If you want to put out a classic vibe, you can’t go wrong with a seersucker suit. However, for a bold look, choose brightly colored pants and a matching dress shirt. Don’t be afraid of eye-catching patterns; all it takes is the right attitude to pull it off. Bring it all together with a solid blazer, such a navy jacket. Classic, breezy, and very dapper. Photo by NY Mag. Of course, no man’s Kentucky Derby outfit is complete without a tie. Most men sport neckties, but bow ties are also hugely popular. As for shoes, Oxfords with pastel socks are a great choice. However, if you want to go sockless, slip on some stylish loafers. When it comes to choosing what to wear to the Kentucky Derby, the weather is an important factor. It can get very hot on race day, particularly on the infield, so wearing easily removable layers is recommended for both women and men. Rain is also common, so protect your precious duds with an umbrella or a poncho. Finally, should the sun decide to shine, don’t forget to use sunscreen. You will regret it if you don’t. 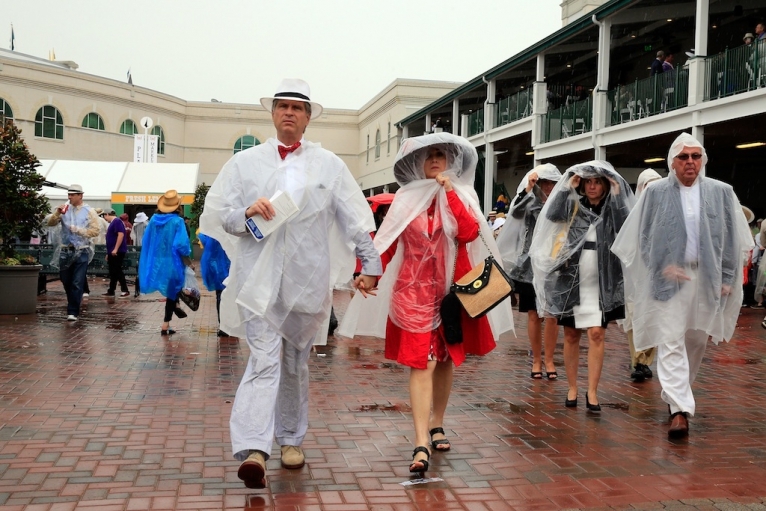 Packing a plastic poncho just in case will help protect your Kentucky Derby attire. Image Source: PRI. You can shop for appropriate Kentucky Derby attire almost anywhere that fits your budget, from vintage shops to swanky boutiques. Just think spring and have confidence in your sense of style as you look around. If the price is no object, you can even have your hat or outfit custom created. On the other hand, many budget-conscious attendees choose to make portions of their own outfit, particularly their hats. Grandma and Grandpa’s closet may also be a great place to look for one-of-a-kind vintage formal wear. For a selection of official Kentucky Derby outfits and accessories, visit Vineyard Vines. Once you’ve picked out the perfect Kentucky Derby outfit, you’re ready to hit the Downs! 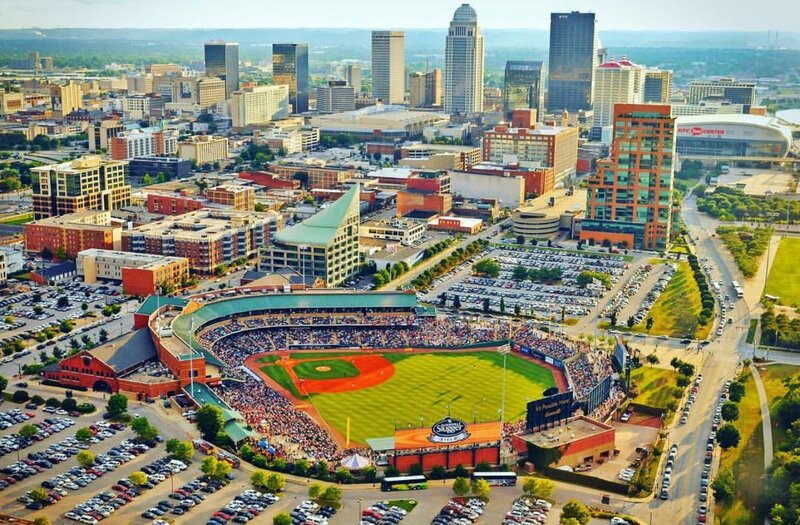 For a stress-free travel experienced with access to insider parties, seamless transportation, and the best hotels in Louisville, explore our Derby Travel Packages.